The action packed MORTAL KOMBAT ANNIHILATION is an extremely fast paced action thriller, without much regard for plot or characters. The visual effects, while massive in scale and the number of shots, are comprised of an interesting blend miniatures, CG animation, and a great deal of digital animation and distortions. The hundreds of effects shots of MK2 never truly achieve photorealism. Mind you, this is not a criticism of the effects--the film's effects fit quite well into the cartoonish atmosphere of the film. There are many fine effects shots in MK2, but none that can really be considered realistic. "There are many fine effects shots in MK2, but none that can really be considered realistic." flares, sparkling digital animation and distortion effects. Combine that with some adequate CG character animation near the end of the film, and a great deal of miniature setups, and you have the bulk of the film's effects. The film opens with a series of sky replacement shots in a sequence that never seems to end. With the camera flying all over the place in a fight sequence, the sky was removed and replaced with a dangerous looking synthetic sky--the removal and insertion of this new sky was very integrated in many cases, but in others, matte lines and the lack of motion blur of elements passing in front of the sky made the backgrounds stand out. There must be sixty or seventy shots in a row of sky replacements, and none of them were straight, lockoff shots--quite an amazing feat. Two of Kleiser-Walczak Construction Company's shots from MORTAL KOMBAT ANNIHILATION. For shots involving the 20-foot gargoyle that breaks out of statues, KWCC animated a highly complicated CG model, derived from a 3D scanned sculptures of the creature. 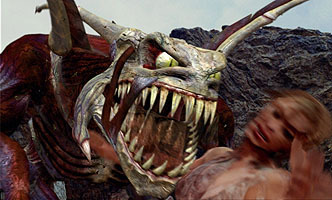 For shots where the gargoyle would be tossing a human at great rates of speed, KWCC used one of its "synthespian" digital models to interact with the creature. Subtlety has no place in a film like MK2, and the same goes for the visual effects. Many effects of characters zipping in and out of our dimension are comprised of various light effects and animation, lens flares, and some particle animation, usually layered together in an eye popping combination. A terrific sequence, the most memorable of the film, takes place as characters use a strange circular ball to move in and out of caverns under the earth. These sequences, comprised of miniature effects with some compositing of human beings, are dazzling and are the most photorealistic shots of the movie. Another of the realistic successes of the film lie in a dozen or so shots of a four armed character. The woman's second pair of arms, just below her 'normal' pair, truly seem to be a part of her. The compositing of her shots are really fantastic. One of the more memorable shots of the film is a crane up from the center of the earth, showing gobs of lava flowing below. The camera cranes above a layer of mist to reveal a live action plate containing our hero, walking around in a cave. Of the CG creatures in the film, the most memorable is the one that appears from a rock formation in the desert. Although only appearing in three or four shots, this creature's movement was dynamic, and its textures and appearance were quite realistic. Delightfully subtle, also, is the approach of three soldiers near the end of the film, that seemingly crawl underneath ancient ruins on their way down to meet the heroes in battle. This simple yet interesting digital technique worked quite well, and stands out as one of the more memorable scenes in the movie. A typical shot featuring dozens of layers is another memorable image, where the James Remar character consults the Gods, while sitting in the middle of a fountain in the shape of the Mortal Kombat symbol. The fountain is mesmerizing, with accurate reflections of the surrounding candles depicted. There are countless transformations and explosions in the film--a character disappears into a portal, or throws out a wave of distortion, or something supernatural--and they all are really neat to watch. Unfortunately, there are just SO MANY of those shots, that they all pretty much blend together in the audience's memory. MORTAL KOMBAT ANNIHILATION represents the very worst kind of entertainment for today's children. The film is a mind numbing collage of violence without consequence and very harsh language for no reason whatsoever. Female characters, while being able to fight as well as the male characters, are scantily clad and are taken prisoner, waiting to be rescued by a man. In a particularly pathetic scene, two female characters mudwrestle. Why do Hollywood producers make this garbage for our children? The effects of MK2, while not being as realistic as other major motion pictures' effects, fit the context of the film quite well.